Last year on a patch of lawn in a garden in Kent, UK, I saw one of the longest running scientific experiments in the world – Darwin’s wormstone. The garden is part of the family home of Charles Darwin – Downe House – and is now a living museum dedicated to his life and work. His Galapagos voyages are legendary, but Charles Darwin made one of his biggest discoveries at the bottom of his garden. The experiment, started in about 1839, and still continuing today, measures the displacement of soil under the stone as a result of worm activity (about 2.2mm per annum). As worms travel through the soil, ingesting mineral and organic material, they break down root mats and leave tunnels for oxygen and water to penetrate the soil. These tunnels become coated with a nitrate-rich mucus, secreted by the worms, which encourage and feed root growth. 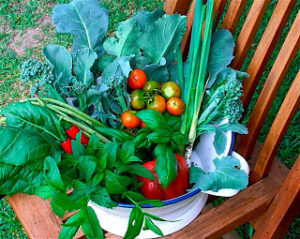 Worms are essential for a healthy garden. They eat their own weight every day and produce the same amount in vermicasts – amazingly these are far richer in minerals than the soil the worm ingested – natural soil fertilizer.How is this done?In many soils, earthworms play a major role in converting large pieces of organic matter (e.g. dead leaves) into rich humus – improving soil fertility. This is achieved by the worm’s actions of pulling down into the soil any organic matter deposited on the surface, such as leaves or manure, either for food or when it needs to plug its burrow. Once in the burrow, the worm will shred the leaf and partially digest it, then mingle it with the earth by saturating it with intestinal secretions. Worm casts can contain 40% more humus than the top 20 cm of soil in which the worm is living. Darwin estimated that arable land contains up to 53,000 worms per acre (13/m²), but more recent research suggests that even poor soil may support 250,000/acre (62/m²), whilst rich fertile farmland may have up to 1,750,000/acre (432/m²), meaning that the weight of earthworms beneath a farmer’s soil could be greater than that of the livestock upon its surface. 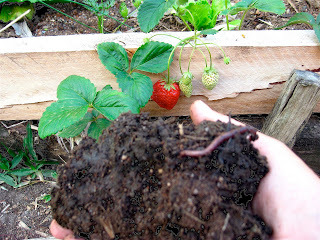 How to encourage worms in your garden – just keep adding organic matter e.g. composted manures/grass clippings/wood chippings, leaf litter and mulch, mulch, mulch – which helps to control an even temperature in the soil and stop it from drying out – just what the mighty earthworms need. 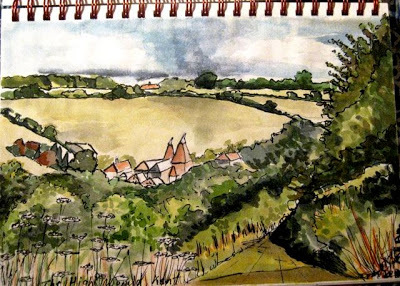 The North Downs, Kent, close to Darwin’s House. Beautiful countryside with a wonderful network of public footpaths. I wonder if Darwin coined the phrase about ‘leaving no stone unturned’?